What is it? 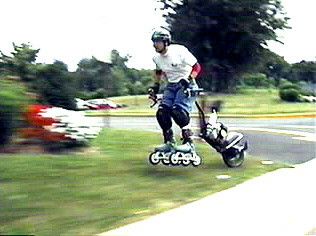 The Roller Cycle is a personal power accelerator to be used with inline skates, skateboards, Mountainboards, snowblades, snowboards, and anything on wheels or skis. 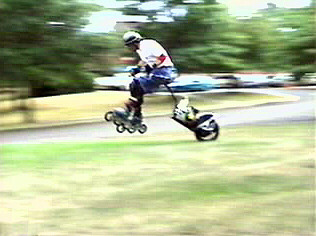 The Rollercycle puts you on the cutting edge of extreme sports with a 1.5 horsepower engine propelling you safely up to 25 MPH. 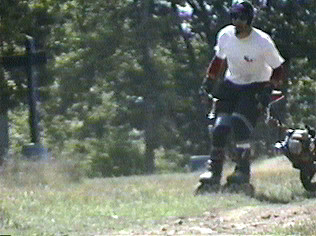 The Roller Cycle is for intermediate and advanced skaters. 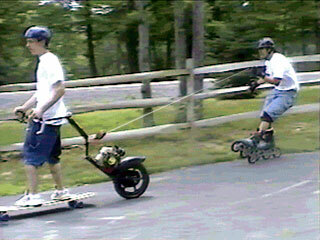 Before you can use the Roller Cycle, you must first prove that you can use your skates or skateboard proficiently. The main concern is that the skater is able to stop with complete control. If you have trouble stopping, do not try the Roller Cycle until you can. 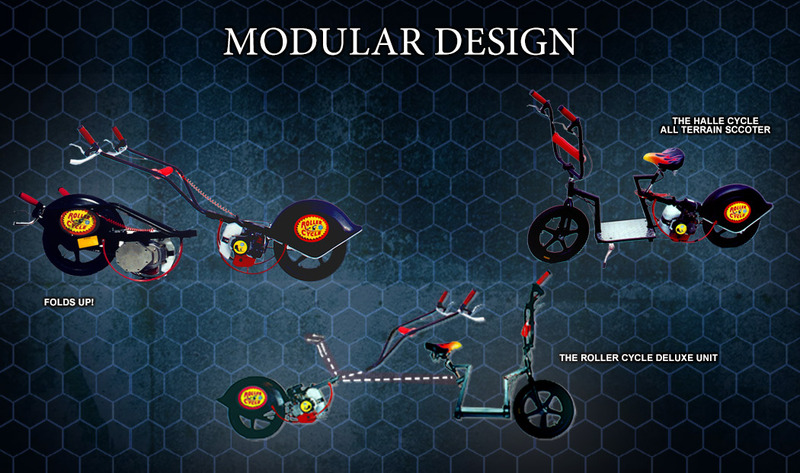 The Roller Cycle is different from any other product. 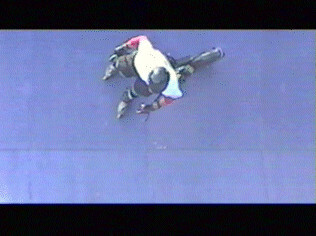 The rear propulsion gives the skater, skateboarder or skier, the unique freedom of using their body to control movement. There is no other steering but your own feet. This gives the operator the ability to skate with it to increase their speed, IF THEY DARE! It is the closest thing to strapping on a jet pack. The Roller Cycle gives you the ability to skate on any surface including dirt, grass and even sand! The Tow Rope accessory lets you pull a friend along for added fun, a great workout and extreme sports! The Hallecycle the Heavy Duty All Terrain Scooter. 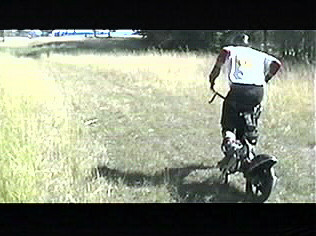 The Hallecycle works on grass, dirt and even snow. 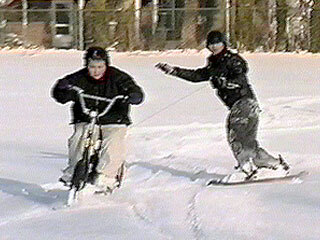 The Hallecycle Attachment enable the Hallecycle to travel over hard packed snow and ice. The Roller Cycle Deluxe Unit comes with both the scooter attachment and the handle bar assembly. Modular Design allows you to easily swap parts with just a few cottar pins in to either scooter mode or Roller Cycle mode.